ITProPortal goes inside Accenture's The Dock R&D facility to hear more about the company's next big focus. ITProPortal recently visited Accenture's The Dock facility in Dublin to hear all about how this new and exciting space is helping one of the world's leading technology innovators to stay one step ahead of the game. 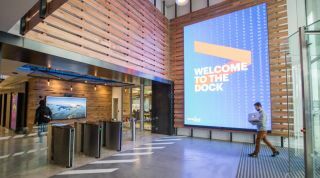 Opened in February 2017, The Dock forms a dedicated research and development hub for Accenture's latest projects, allowing the firm to spread its focus across industry sectors as it examines the latest trends and tools. The five storey building houses a range of Accenture employees working on a large number of projects, including experts on areas such as artificial intelligence, virtual reality and the IoT. The facility also houses the Fjord design team, acquired by Accenture back in 2013 as part of a drive to bring inspiring and engaging design to the company's customers and clients. Inside the building, the impetus is very much on collaboration and innovation, with workers able to customise their work environment completely - even down to having detachable desks which can be wheeled around to join up with colleagues in a different area. The office space has many dedicated meeting and co-working areas, with huge Microsoft Surface Hub screens dotted liberally around each floor, allowing for yet more integration and collaboration, and even has its own in-house laboratory space for testing out new hardware designs. Our visit came as Accenture revealed new research which highlights just how much heavy industry could benefit from using digital technologies. The study found that UK manufacturers could unlock an estimated £455 billion in value over the next decade by harnessing industrial digitalisation - equivalent to more than London’s entire annual contribution to the UK economy. Artificial Intelligence was identified as having the biggest potential to drive growth, with an estimated benefit of over £91 billion, followed by automation and robotics (over £54 billion) and additive manufacturing (almost £28 billion). Combined, they could also help to deliver broader societal benefits, including reduced greenhouse gas emissions due to more efficient uses of energy and resources, and a significant reduction in workplace injuries. “There is a clear need to secure the UK’s place in the industrial race, and faster adoption of digital technologies can both improve efficiency and generate new revenue streams. Most manufacturers we work with are beginning to recognise this, but many aren’t yet realising this potential. This research quantifies the potential prize for industry, individuals and society if they get this right,” said Ben Salama, MD at Accenture Digital.